N.B. 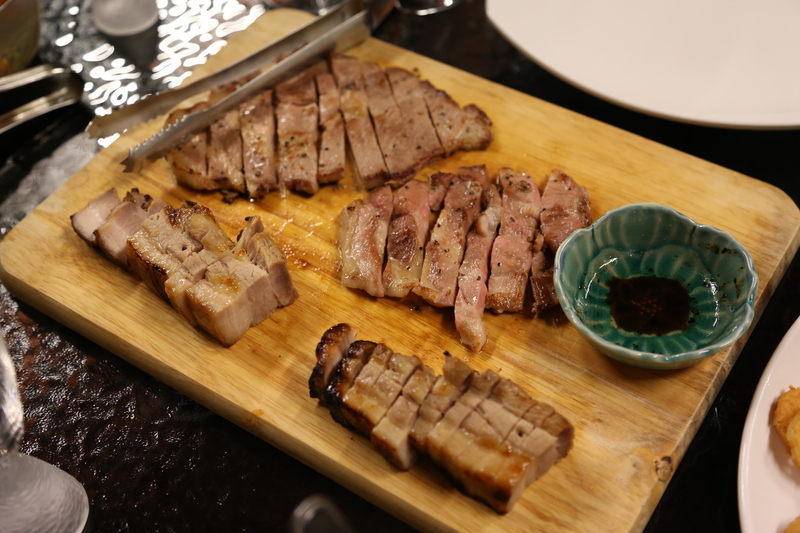 subsequently i did a wonderful melt-in-the-mouth miso belly pork dish for a homecooked japanese-themed dinner on 12.12.2013, but finished by pan-charred over butter instead of oven broiled. i can call this a self-invented recipe. 🙂 basically, after i started making a rather good Nobu miso cod, i was trying to re-use the miso (didn’t want to make miso soup all the time and didn’t want to discard the miso after 1 use). 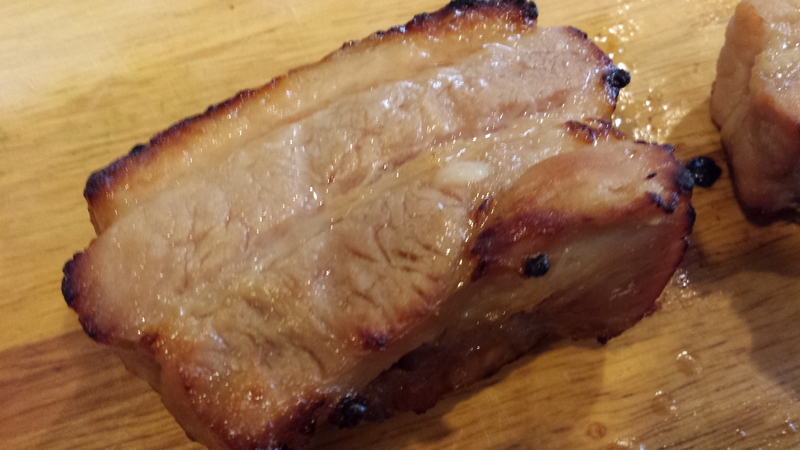 also i was having a hard time making char siew both getting the texture right & also charring the outside. & not to forget the very lovely miso belly pork we had for the wonderful set lunch at pollen @ gardens by the bay! 🙂 just a note – though i started my experiment by reusing the miso, for best effect the proper way of course is 1 use & discard (or make miso soup..haha..) & for sure i would not use the miso cod miso for belly pork or vice versa, so if reuse then use second time only for the same meat! anyway i put the belly pork to marinade in miso for 3 days as i would when preparing miso cod. before that i rinsed the belly pork with boiling water, then cleaned up in cold water & then cut off the skin. unlike miso cod which you don’t want it to be too sweet, i added one more heap tablespoon sugar to the marinade. 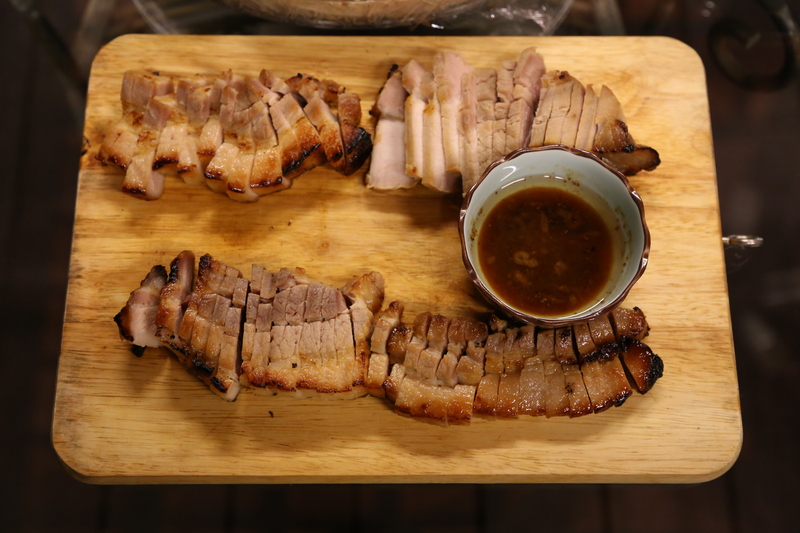 when cooking, i took out the belly pork & placed it in an oven dish with lid with the marinade just covering the pork for 1 hr to get it to room temperature. i then placed it in the preheated oven at 90degC for 1 hr. after removing it from the oven, i placed the pork on a rack over an aluminium foil lined baking tray, and preheat the oven to the highest temperature at 250degC. i then turned it to broil & cooked the pork for 11 minutes, turned over & broiled for another 5 minutes=total broiling time 16 minutes. i did this for 600g of belly pork + pork collar combined about 3/4 portion was served as in the top photo. i did a second time for about 250g (the belly pork portion in the 2 photos below which included kurobuta steaks), and i had to adjust the timing to 8minutes + 5minutes=total 13minutes. if you have a meat thermometer, you can also check for 170degF or 77degC . note the broiling time is key – though it is important to char the outside the inside will overcook if the timing is wrong! boil saké and the mirin in a medium saucepan over high heat for 20 seconds to evaporate the alcohol, turn to low and add the miso paste, stirring to dissolve the miso completely, then turn to high again and add the sugar, stirring constantly so that the bottom of the pan doesn’t burn. cool down marinate mix to room temperature. 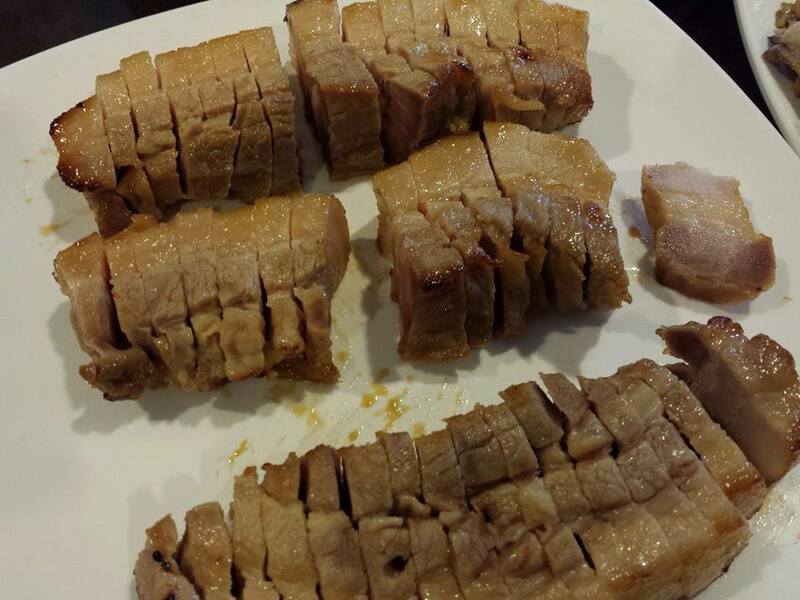 rinse belly pork with boiling water, then clean in cold water & then cut off the skin. place belly pork strips in a ziplock bag & pour in the cooled marinate and leave in fridge for 3 full days. turning over once in the morning & once in the evening to ensure all sides are fully coated. take out belly pork & place it in an oven dish with lid with the miso marinade just covering the pork for 1 hr to get it to room temperature. place it in the preheated oven at 90degC for 1 hr. after removing it from the oven, place the pork on a rack over an aluminium foil lined baking tray, and preheat the oven to the highest temperature at 250degC. 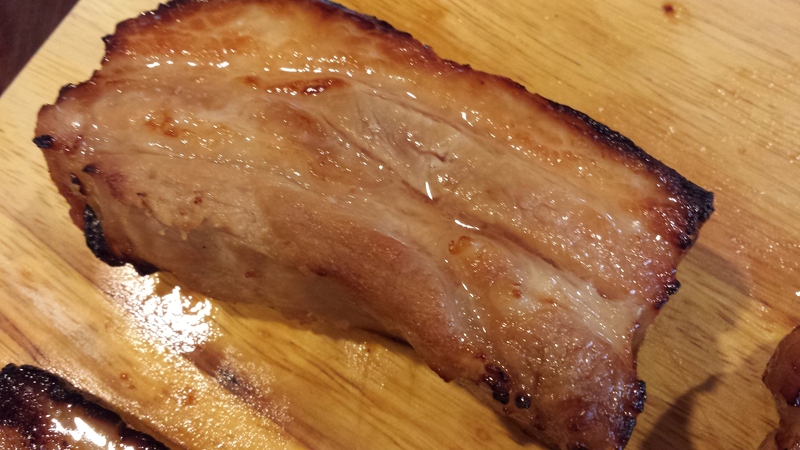 turn to broil & cook the pork for 11 minutes, turn over & broil for another 5 minutes=total broiling time 16 minutes. 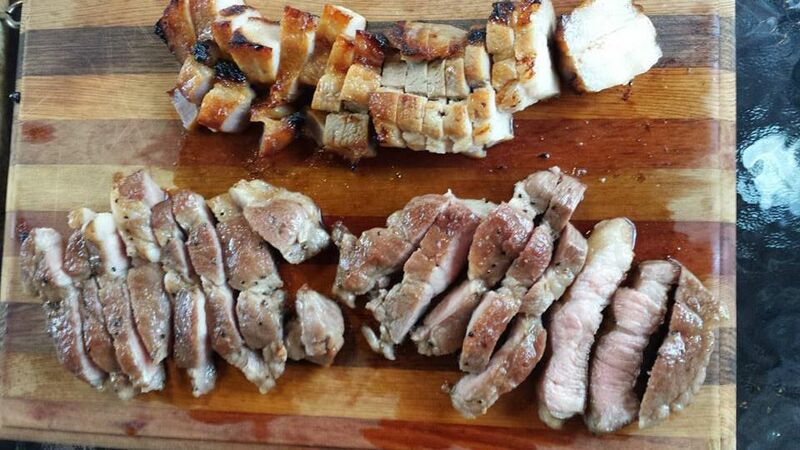 This entry was posted in Recipes and tagged belly pork, char siew, mirin, miso, pork collar, sake. Bookmark the permalink.